Keep your feet cozy with plush animal slippers. Plush animal slippers will put a smile on your face and a spring in your step. Who wouldn't want to walk around the house with pleasingly plush animals on their feet? Your toes will thank you for swaddling them in such furry comfort. In fact, these ultra-cozy slippers are so luxurious you may have a hard time removing them and putting on your winter boots or high heel pumps. Plush animal slippers offer warmth and whimsy to people of all ages. What's more, contrary to popular belief, kids are not the only ones going crazy for comfy animal slippers. Animal-loving adults are also huge fans of the unique footwear, and since animal slippers are one size fits most, you don't have to have worry about knowing a person's exact show size in order to gift them with proper fitting novelty slippers. Fuzzy animal slippers have come a long way since they were first introduced in the 1950s. Back then manufacturers produced simple slippers featuring an animal's head and little else. Today, novelty slippers are so plush and realistic it's as though you are sliding your feet into real stuffed animals.Each adorable pair of animal slippers is designed to look like your favorite furry or feathered friend. They feature cuddly faux-fur and come with a cushioned foot bed that makes every step feel like your waking on marshmallows. Most of these novelty slippers include a plush upper portion crafted with life-like animal features which wrap around your feet up to your ankles. An elastic edge is also added to ensure a snug, comfortable fit. In addition, the bottom of the slipper includes padding, and non-skid, water resistant soles. 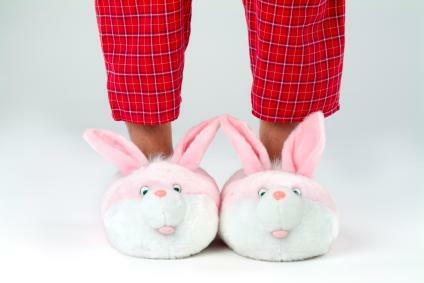 BunnySlippers.com: BunnySlippers.com is a leader in the slipper industry. The company offers a huge variety of overstuffed animal slippers featuring extensive detail work and high quality fabric. The slippers, featuring exotic and traditional animal exteriors, come with extra soft and comfy cushioned soles, no-slip bottoms, and full backs for whole-foot coverage. CrazyForBargains.com: This company offers comfy, fun pairs of animal slippers at affordable prices. In addition, the site specializes in hard-to-find animal scruffies, including zebra, giraffe and sea turtle slipper styles. MookieGifts.com: Whether you are looking for dolphin, killer whale or duck-shaped animal slippers, you can find them at MookieGifts.com. The company's soft animal slippers will keep your toes warm on chilly mornings and their thick foam soles will have you walking in comfort. The company also carries aromatherapy animal slippers. Each pair of the unique slippers includes microwavable grain filler inserts, scented with cypress and lemon grass essential oils, to warm tired feet.